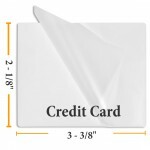 Credit Card Size Heat Seal Lamination Pouches Measure 2 1/8" x 3 3/8" (54mm x 86mm). Our Credit Card Pouches are available in Thicknesses: 5 Mil, 7 Mil or 10 Mil. Finishes: Clear Gloss, Color, Matte and Sticky Back Thermal Laminating Sheets. 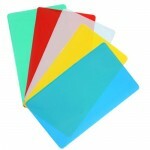 Also check out the deep discounts available on Credit Card Laminating Film in Bulk.